(Vancouver, B.C.) - The BC Lumber Trade Council issued a statement today with respect to Canada and the U.S. concluding the United States-Mexico-Canada Agreement [USMCA]. "BC lumber producers congratulate Minister Chrystia Freeland and the Government of Canada on reaching a renewed trade agreement that preserves the dispute resolution mechanism previously contained in Chapter 19 of NAFTA," said Susan Yurkovich, President of the BC Lumber Trade Council. "Chapter 10 of the new agreement maintains, for Canada and the U.S only, a binational panel review mechanism for reviewing anti-dumping and countervailing duty determinations by either country," added Yurkovich. "Having a robust and fair dispute resolution mechanism is absolutely critical to maintaining a rules-based trading system and providing an avenue for Canada and Canadian companies to appeal unwarranted duties." "The duties imposed by the U.S. Department of Commerce on Canadian softwood lumber are punitive and unfair, and are driven by the U.S. lumber lobby solely for the purpose of constraining imports of high-quality Canadian lumber to drive up prices for their own benefit. Ultimately these duties punish consumers and workers on both sides of the border," said Yurkovich. "Finding a durable resolution to the softwood lumber dispute must remain a key priority." B.C. is the largest Canadian exporter of softwood lumber to the U.S., making up about half of Canada's total lumber exports. The B.C. forest industry is a major contributor to the provincial economy and supports approximately 140,000 jobs in the province. The BC Lumber Trade Council is the voice of trade matters for companies in British Columbia representing the majority of B.C. lumber production. For decades, the Canadian lumber industry has been subject to unfair and unwarranted duties imposed by the U.S. Department of Commerce, and has filed appeals under the NAFTA and WTO agreements. We know that when unbiased entities review these unfair trade practices, they have found in Canada’s favour. 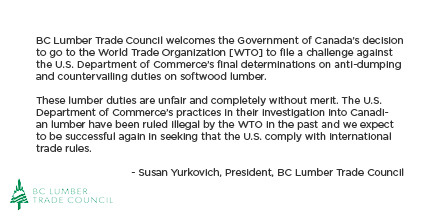 BC Lumber Trade Council welcomes the Government of Canada’s decision to go to the World Trade Organization [WTO] to file a challenge against the U.S. Department of Commerce’s final determinations on anti-dumping and countervailing duties on softwood lumber. These lumber duties are unfair and completely without merit. U.S. Department of Commerce’s practices in their investigation into Canadian lumber have been ruled illegal by the WTO in the past and we expect to be successful again in seeking that the U.S. comply with international trade rules. VANCOUVER, B.C. – B.C. lumber producers will continue to vigorously defend against the U.S. trade action on softwood lumber following the announcement today by the U.S. Department of Commerce on final duty rates. The combined duty rates for BC companies range from 20.83% to 23.76%. Lumber producers will be required to pay the revised anti-dumping duty rate within days. The final countervailing duty rate would be imposed if and when the U.S. International Trade Commission makes a final determination on injury. This decision is expected no later than December 18, 2017. B.C. is the largest Canadian exporter of softwood lumber to the U.S. The B.C. forest industry is a major contributor to the provincial economy and supports approximately 140,000 direct and indirect jobs in the province. The BC Lumber Trade Council is the voice on trade matters for companies in British Columbia representing the majority of B.C. lumber production. VANCOUVER, B.C. – B.C. lumber producers will continue to vigorously defend the industry against a new round of preliminary anti-dumping duties imposed by the U.S. Department of Commerce on Canadian softwood lumber. The preliminary anti-dumping rates imposed by the U.S. today are as follows: Canfor 7.72%, Resolute 4.59%, Tolko 7.53%, West Fraser 6.76%, and 6.87% for ‘all others.’ These anti-dumping duties are in addition to the preliminary countervailing duties imposed in April 2017 and result in a combined duty rate ranging from 26.75% to 30.88% for B.C. producers. VANCOUVER, B.C. – The BC Lumber Trade Council (BCLTC) welcomes the federal government announcement today of measures to support forestry workers and communities impacted by the duties imposed by the U.S. on softwood lumber. “BC lumber producers welcome the announcement today of measures to support forestry workers and communities during this trade dispute, as well as promoting forest sector diversification, overseas marketing and innovation,” said Susan Yurkovich, President of the BC Lumber Trade Council. B.C. is the largest producer of softwood lumber and represents about 50 per cent of Canadian exports to the U.S. The B.C. forest industry is the cornerstone of the provincial economy, and supports approximately 145,000 direct and indirect jobs in the province. The BC Lumber Trade Council is the voice on trade matters for companies in British Columbia representing the majority of B.C. lumber production. VANCOUVER, BC – Today, the U.S. Department of Commerce imposed punitive preliminary countervailing duty rates on Canadian softwood lumber in response to a petition filed by the protectionist lumber lobby in United States. In this preliminary determination, countervailing duty rates imposed are as follows: Canfor 20.26%, JD Irving 3.02%, Resolute 12.82%, Tolko 19.5%, West Fraser 24.12%, and 19.88% for all other British Columbian and Canadian producers. The U.S. Department of Commerce [DOC] also found “critical circumstances” which means duties will be retroactive 90 days for all companies other than the mandatory respondents. “The finding of critical circumstances in this case represents an unprecedented departure from the DOC’s typical approach and produces an entirely arbitrary result,” added Yurkovich. Constraining Canadian lumber imports by applying punitive duties creates price volatility in the lumber market. These unwarranted duties are being reflected in higher lumber prices, driving up costs for American consumers, especially for families who want to build, buy or renovate a home in the U.S. Concern about the impact of duties on American families and homebuilders is already being expressed by the U.S. National Association of Home Builders (NAHB). Their analysis shows that even with a 15 percent tariff, there would be a loss of 4,600 American jobs and $265 million in lost wages and salaries in the U.S. residential construction and renovation industry alone. BC Lumber Trade Council will hold an in-person media availability and teleconference. VANCOUVER, B.C. – The BC Lumber Trade Council (BCLTC) welcomes the announcement today by Natural Resources Canada to establish a federal-provincial task force on softwood lumber.